Terrorism is a creeping phenomenon. It grows and evolves; changes and adapts. It lives off the fear and multiples the fear to spread. 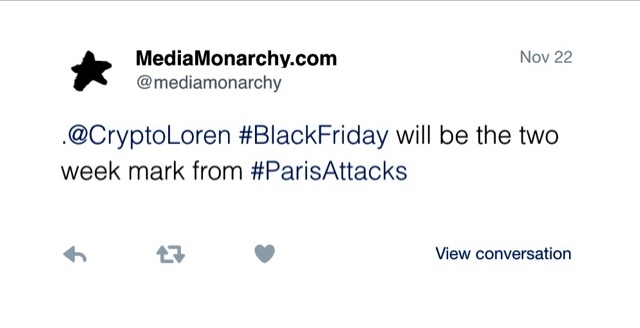 One part of the Paris terror attacks of Friday, 13 November 2015, targeted a European football (to North Americans, soccer) stadium. There were three suicide bombings outside the Stade de France (the national stadium of France) in Saint-Denis, a northern commune or suburb of Paris. We are living in a time in which the potential for stadium terrorism is real and the threats are taken seriously. On Tuesday, November 17, 2015, the friendly soccer game between Germany and Netherlands was cancelled with just 90 minutes before kick-off, at the Niedersachsenstadion in Hannover, Germany. German chancellor Angela Merkel was due to be in the stadium for that match. Another stadium in Hannover, the TUI-Arena, was also evacuated. The music band Söhne Mannheims were set to play there that evening. In Belgium, on Tuesday, November 17, 2015, a game between Spain at Belgium was cancelled due to the heightened security alert caused by the Paris terror attacks. In the American psyche, through popular culture, a real fear has been that there will "soon" be a terrorist attack at a NFL game, in a major American stadium. With all the threats against Washington D.C., will it be at a game around the USA's capital? The Washington Redskin will play at Bank of America Stadium in Charlotte, North Carolina, on November 22, 2015. What will happen tomorrow, on the anniversary of the John F. Kennedy assassination? Hopefully, nothing. Nevertheless, this psychology for this forecast goes back to the 1970s. Long before the 2002 film, The Sum of All Fears, had an atomic bomb that was obtained from a Syrian go off at an NFL game in Baltimore, there was 1977's Black Sunday. But there's something in the air, and the terrorist organizations use this something. 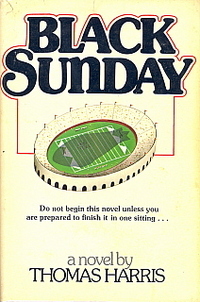 The tagline for the movie Black Sunday is "It could be tomorrow!" The International Skeptics Forum noted in 2011 that a certain researcher (its not important for this discussion to identify who) said that "there may be a nuclear bomb detonated during Superbowl XVL and if not tomorrow, at a future mass event, where hundreds of millions of viewers will be watching....[The] prediction is based on his interpretation of decades of pop culture, which he sees as the primary means of conditioning the populace, in the tradition of conspiracy theorist, James Shelby Downard, whose works examined perceived occult symbolism, twilight language and synchronicity behind historical events in the 20th century." Black Sunday is a 1977 American action-thriller film directed by John Frankenheimer, based on Thomas Harris' novel of the same name. The film was produced by Robert Evans and starred Robert Shaw, Bruce Dern and Marthe Keller. It was nominated for the Edgar Allan Poe Award for Best Motion Picture in 1978. The novel that started it all. 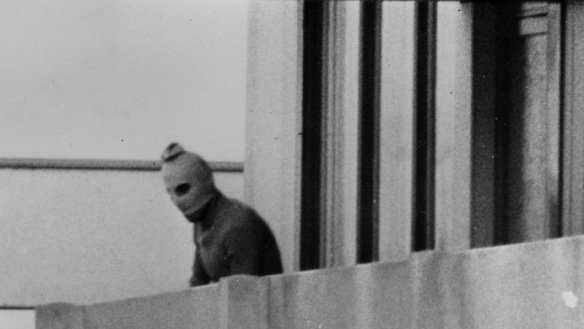 The inspiration of the story came from the Munich massacre, perpetrated by the Black September organization against Israeli athletes at the 1972 Summer Olympic, giving both the novel and the film its name. In the realm of syncs, a number of some significance, in recent years is 42, and its mirror, 24. Black Sunday's promotional photos prominently display a football player wearing "24." In the film actual NFL footage is used of the Dallas Cowboys playing the Pittsburgh Steelers. In the book, the bomb via a blimp will detonate over Tulane Stadium during a Super Bowl between the Miami Dolphins and the Washington Redskins. In Black Sunday, Marthe Keller plays Dahlia Iyad, an operative from the Palestinian terrorist group Black September. Although she was clearly scripted to be Palestinian, there was a hint that she was aligned with the German terrorist group the Red Army Faction (also known as the Baader-Meinhof Group or Gang during its early days; the RAF was active in German from 1977 through 1998). Black Sunday was banned in Germany and Japan. Tomorrow is November 22, 2015. Super Bowl 50 will be played on February 7, 2016, in the City of Santa Clara at Levi’s® Stadium, in the San Francisco Bay Area, California. For Black Sunday, the landing and hijacking scenes were photographed at the Goodyear airship base in Carson, California with Columbia (N3A); a short scene in the Spring, Texas base with the America (N10A), and the Miami, Florida Super Bowl scenes with the Mayflower (N1A), which was then based on Watson Island across the Port of Miami. Toyota is now advertising, a "Black 10 Days Sales Event". In the film, Black Sunday, were the letters and Goodyear logo in black? The Good Year logo of course is the winged sandaled foot of Greek god Hermes & Roman god Mercury. These gods share a connection with communication; boundaries-travelers-roads, and thieves. Mercury is also connected to financial gain, commerce, trickery and thieves. While Hermes is connected with inventions, trades, herdsmen (sheeple), and sports. Considering the MSM (communication) is reporting on immigration issues (boundaries-travelers)coming so close to a consumeristic holi-day(commerce, trade, thieves), some event is sure to resonate with the black (or nigredo) stage of civic alchemy. American to the core. They have made a good start to the point that a non football idiot like me can see the end game. Please don't get me wrong here, I think anyone that enjoys football is most likely a great American, see why it must come down?